Gunpowder potatoes are India’s spicy, wonderfully delicious answer to chili cheese fries or poutine. Not as messy mind you, but just as tasty. Indian taste meets addictive North American junk food flavour. Grilled. With butter. And Indian spices. There is nothing not to love here. Dishoom is a trendy Indian restaurant in London’s west end. Big lines. Big prices. Posh Indian. A big deal. But there’s no reason you can’t make them yourself. This is my adaptation of their gunpowder potatoes. These are a bit more restrained and lighter on the whole spices but pretty similar in concept. You can push them closer to the original by upping the chili and whole cumin seeds. But any way you try them, they are absolutely killer delicious. This dish is a riff on Indian street food. Aloo chaat specifically. 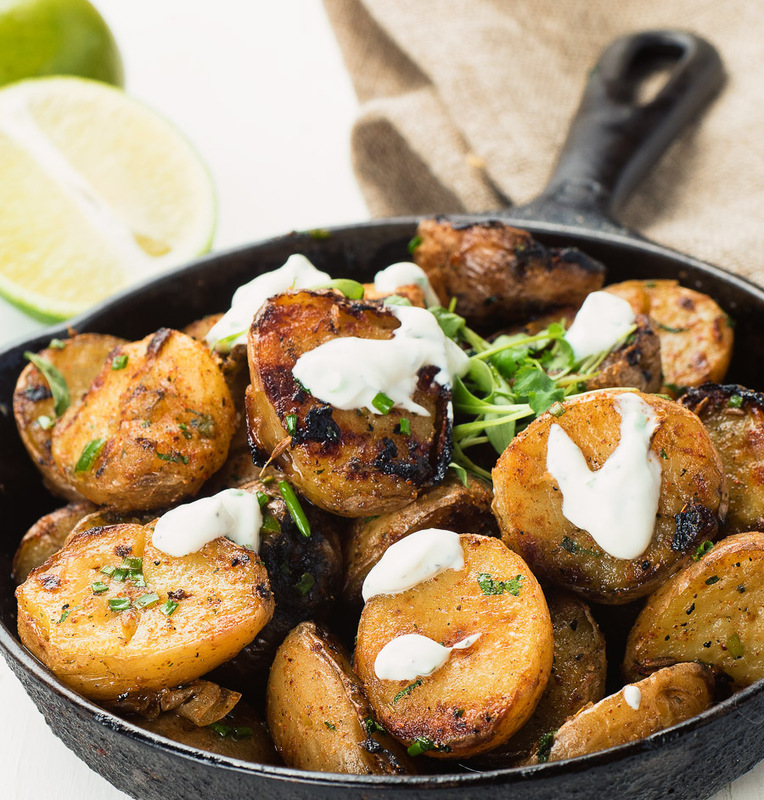 Potatoes with chaat spices. The key flavour comes from chaat masala. You have to buy chaat masala at an Indian grocery store. The key to getting these potatoes crusty on the outside but creamy on the inside is to boil them first. Then you toss them with a good amount of oil. This does something magic. As you toss them they get a bit scuffed up. And that scruffed texture makes for little nooks and crannies. Those nooks and crannies are gong to crisp up beautifully on the grill. They are going to catch final spice and butter mixture and hold it close. This is a technique you can use when you roast potatoes as well. Works great. Maybe boil them a little less (more par-boil). Toss them until they start to scruff. Add a good amount of olive oil. Or duck fat. Mmm… Duck fat. Salt liberally. Roast in the oven. Something to really jazz up your next Sunday dinner. Gunpowder potatoes. They make a great appetizer but they are also a terrific side dish for tandoori chicken. 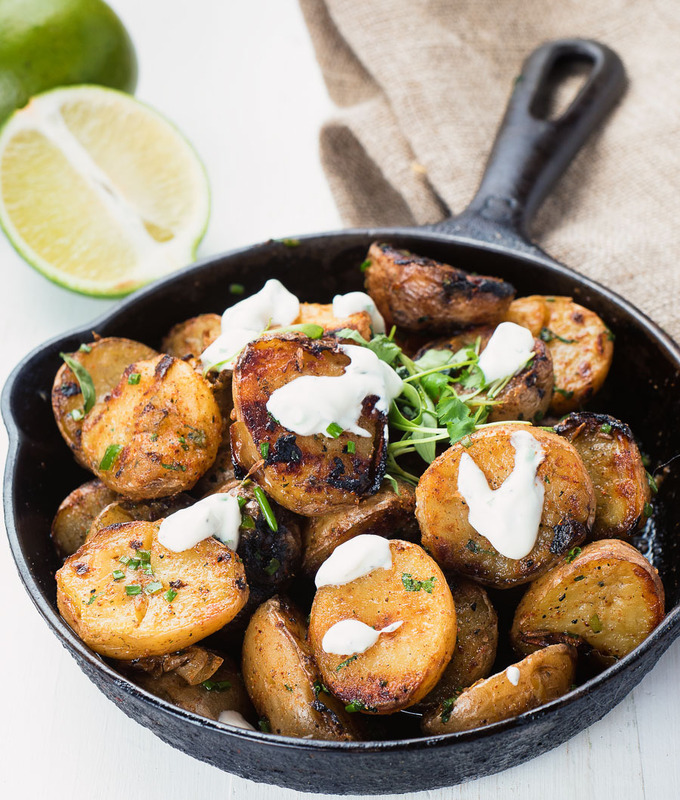 Gunpowder potatoes are a riff on aloo chaat. They make a great starter or a fantastic accompaniment to tandoori chicken. Combine all the ingredients except the milk. Add the milk a tiny bit at a time until you get to the texture of regular yoghurt. Let potatoes cool enough handle. Cut the potatoes in half lengthwise and toss with vegetable oil. Skewer the potatoes (not essential but it makes grilling way easier) and grill, over medium direct heat until golden brown - around 8-10 minutes. They are already cooked so all you want to do is brown and crisp them. Crumble the kasoor methi between your fingers. Combine the chaat masala, kashmiri chili powder, salt and kasoor methi. Put them in a shaker if you have one. That's what they do in restaurants. Toss the potatoes with the butter, lime juice, cilantro, green chili, cumin seed and green onions or chives. Sprinkle with the spice mix to taste and toss to combine. You won't need all of the spice mix. Add a bit less than half to start and then keep adding it until you get to where you want to be. Serve with more lime and the mint raita. Mint sauce is not mint jelly. You could also use 1 tsp fresh mint with a pinch of sugar. Don't use mint jelly. In appetizer, bbq and grilling, indian, sides and stuff. Bookmark the permalink.